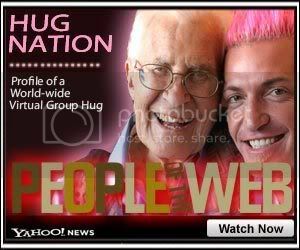 A 94-year-old Baptist Minister and his 35-year-old grandson soothe lonely hearts with online hugs, and in the process, preserve a legacy. Those pesky oceans keep us from doing the weekly hug physically, so we do it virtually. Thousands of people around the world gather in front of computers to hug themselves and the people around them at a set time. Rather than a shared physical space, it is a shared mental space. Regardless of where you are on Tuesday at 1-pm (PST), you can join the Group Hug. Squeeze yourself in your car or in the supermarket. Hug your spouse or co-worker. Just visualize the thousands worldwide who are joining you at that moment. Think of it as a sort of prayer — a communal expression of compassion. It is a weekly reminder that we are connected and we all far more similar than we are different. Everyone can use a hug.